Sooooo pretty! The total eye-candy Isle 10’8” Soft Top stand up paddle board comes in a variety of beautiful retro print colors, evoking the style of classic wooden longboard surfboards. This is one of the most beautiful stand-up paddle boards we’ve seen, especially at this super low price. The soft top construction makes it a great, safe choice for beginners, and the patented technology makes this another dependable, but still highly affordable, offering from Isle. With inflatable stand up paddle boards becoming so popular, you may wonder why anyone would want a soft top board at this point. We think there will always be a place for soft top boards, for a couple reasons. First, the soft-sided rails make them extra safe for beginning riders. And for those who have the space to store them, these boards can actually be much more convenient, since you don’t have to reinflate them every single time you bring them out. By opting for a more traditional, solid (non-inflatable) board, you’re getting a board that’s extra stable and well-balanced, and (with the soft top) quite forgiving if you take a fall. 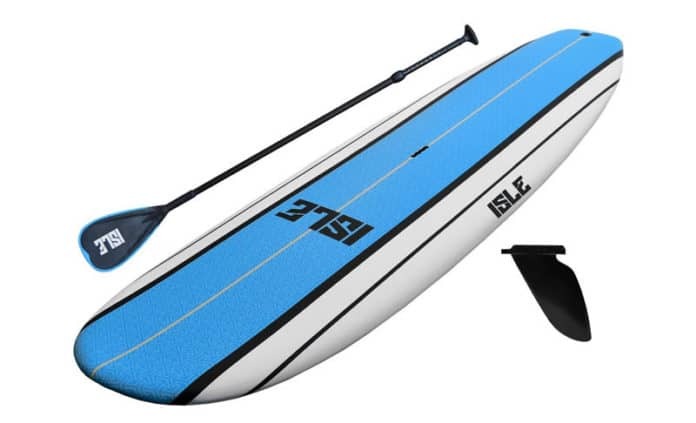 The Isle 10’8” Soft Top is also known for performing impressively well in a variety of water conditions, including small to moderate surf. It should be noted that soft tops are not the most durable boards, unfortunately. For the added safety of a foam board, you will have to take a bit of extra precaution (as opposed to the always-durable inflatables) to avoid running over rocks and banging up the board. 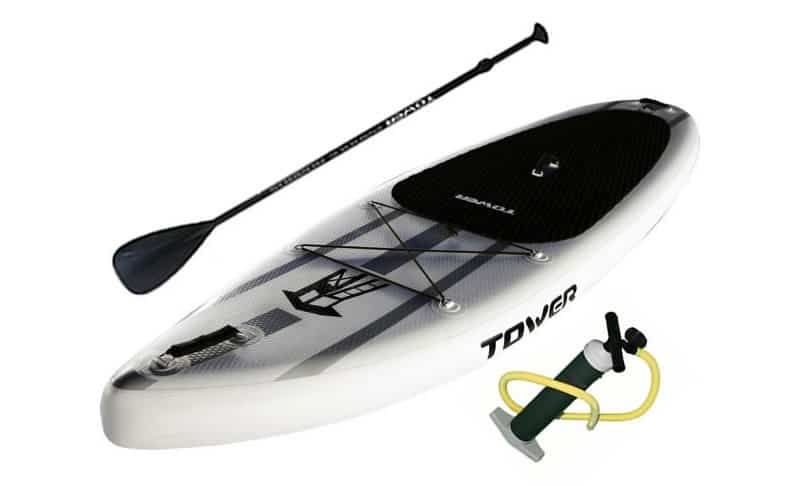 For a similarly-priced inflatable, check out the Solstice Bali or the Blue Wave Sports Stingray, or if you’re willing to go up in price a bit, the Tower Adventurer 2. Again, with these boards you’ll be compromising a bit on safety, but gaining in durability and the convenience of an inflatable. If safety is a priority, read on! The embedded triple wood stringer gives this board stability and rigidity like a hard paddle board, but the nice soft deck makes for a safe ride for beginners. And of course the beautiful “wooden” prints make you look like anything but a beginner. Material: High-Density polyethylene slick bottom, high-density durable IXPE/XPE deck, waterproof EPS foam core, modeled in laminated triple wood stringer. Set up: There’s really no set up with this board. Make sure the fin is attached and you’re ready to go. The Ride: While this board is mainly meant for flat-water paddling, users report that it does an impressive job in a variety of water conditions, including small surf. If you’re planning on going out in the ocean at all, this board may be a better choice over a lot of other stand up paddle boards, which often are not too good in the surf. The non-slip surface also gets high marks. Apparently, Isle holds a patent for its water-resistant soft skin. At 350 pounds, the Tower Adventurer has an unusually high weight limit. Bring a friend on board with you, or bring your dog or both! Super convenient and easy to store. Rolls up small enough to fit into a large backpack. To the average paddler, this board truly looks and feels just like a hard board. You’ll be surprised! Includes a pump, a paddle, fins, and a strap for keeping the board wrapped up in storage — everything you need to get started. While it’s by now means clunky, this is not the board you should buy if you’re going for speed. Doesn’t include a carry bag (though it does have a strap to keep it rolled up). If you want to use an automatic pump, you’ll need an adapter (it takes about 10 minutes to pump using the included hand pump). Some users complain about the fin, which uses a small hex screw, potentially hard to replace. We weren’t too worried about this, but it’s worth noting. Price: 100% – This is a very competitive board at its price point. Material: 100% – The military-grade PVC can’t be beat (literally). Design: 90% – The board itself is solid and well-balanced and has a great ride. No problem there, as far as the board’s functioning. The only design flaws we’ve noticed are relatively small — some users have noted that the paddle does not float if dropped in the water, and as stated, if you happen to want an automatic pump, you’ll need to buy an extra attachment. Overall: 96% – Affordable, unbreakable, and very ride-able. We like it. 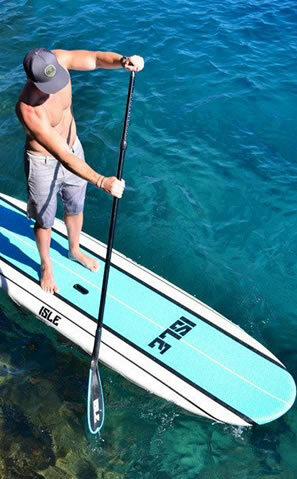 Don’t get the Isle 10’8” soft top if you don’t have space in your garage for a 10’8” paddle board — duh. With inflatables becoming commonplace, this is now an important consideration. If you do need to save on space, check out some of the inflatable boards we mentioned above. Do get this board if you (or a loved one) are a beginning rider looking for the safest ride and at an affordable cost. For super-affordable, you can also check out the foam board offering from California Board Company. While all soft top boards are a bit less durable, the Isle 10’8” soft top is among the highest-rated around, and with it’s patented soft-skin top, we consider this a very dependable foam board. When it’s all about safety and ease of use for beginning riders, this board is a very good choice! 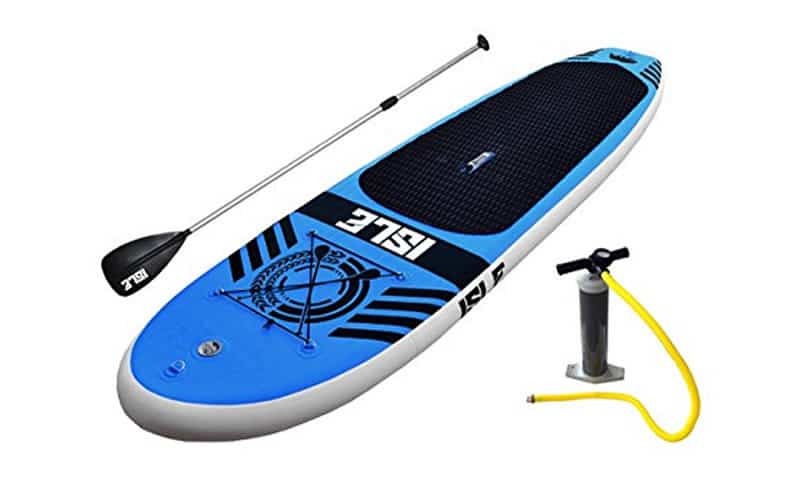 If you’re ready to get this board, check out the Isle 10’8” Soft Top page on Amazon to see the rest of the customer reviews and get that great free shipping. 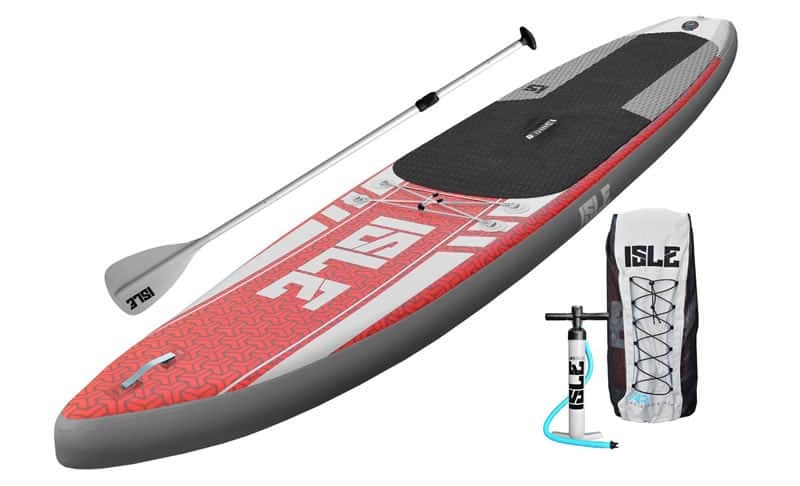 Have you tried the Isle 10’8″ Soft Top? What are your thoughts on the Soft Top SUP? Talk to us about how you like it in the comment section below. The total eye-candy Isle 10’8” Soft Top stand up paddle board comes in a variety of beautiful retro print colors, evoking the style of classic wooden longboard surfboards.